The Motion Picture Association of America (MPAA) released its annual Theatrical Market Statistics Report for 2012 this week. The report illustrates that global box office revenue for all films worldwide reached $34.7 billion in 2012 (+6% over 2011). The U.S & Canada rev was up 6% to $10.8 billion with a 6% increase in admissions to 1.36 billion. 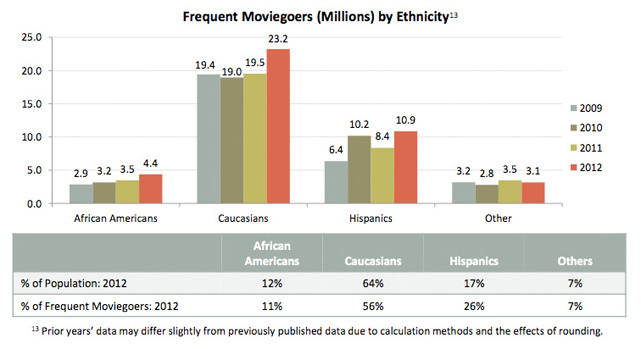 One very noticeable piece in the report was that Hispanics – while only representing 17% of the population in the U.S & Canada – encompassed 26% of all movie ticket purchases. So what does all this information this mean to the independent filmmaker? For one – we can see that there’s a target audience that is not being directly served by the big studio films. This also seems to be a great opportunity for four-walling a film and bypass traditional distribution system. If you have an eager audience that wants to see films, why not make films for them. Click HERE (PDF) for an infographic of the report. Click HERE (PDF) for the full 2012 MPAA Theatrical Market Statistics report.